Yes. 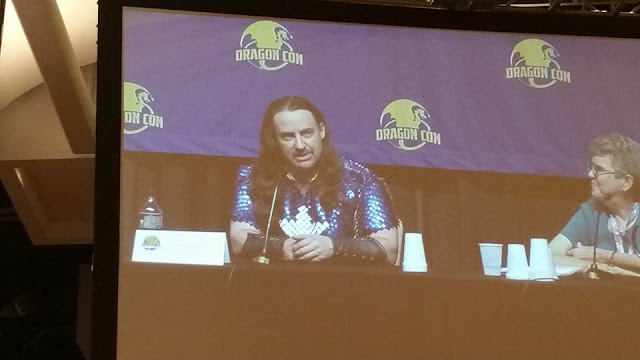 that is Jim Butcher wearing Captain America scale mail armor. It also comes with a chain mail cowl. Jim Butcher is deeply enamored with DragonCon. After multiple signings where no one showed up, or panels at conventions where he was the only one in the room, DragonCon is where he started to feel like an author. In fact, his first panel was in the basement of the Hyatt, and while he was certain no one would show up, he was also determined to at least be there on time. He was stymied by the horde of people in the hallway, blocking his path. He figured that he was going to be late for his own panel. Then everyone started looking at him. "What, do I have something on my face?" "Yes.... do I owe you money?" "We all came here to see you!" And that's when Butcher started to feel like a real writer. One of the first questions at the Q&A session was asking Butcher about a crossover among his various and sundry universes. Butcher declared that it would have to be a multiple universe threat, and Tavi (of Alera) would have to be the mastermind and grand strategist in all of that ... mostly because "Harry doesn't plan." Question: Do you consciously make Harry choose the worst possible option every time. Butcher: Not really. In Changes, I had no idea which route I was going to take. When he was injured, he could have gone one of three ways. He could to to Mab, which he did. He could have taken up Lasciel's coin again. Or even worse, he could have used Kemmler's Dark Hollow. So Harry doesn't always pick the worst possible choice. Mab's the monster he knew. Applause broke out. Butcher: "No, no, don't clap, I'm awkward and self conscious enough." When asked about playing the Dresden RPG, Butcher said, "No, I cannot play the RPG. Imagine being my GM. If I do it, it's too much like work. If I play it, I'd just have to rewrite it the way I would have had it happen. As for the guys who make the game, I just answer questions about the books. That turns into more questions. Which become I gotta stop them before they reach the right conclusions!" Someone asked about the material for the Grey Warden cloaks. "Whatever they use to make the cloaks from Rivendell. It's probably wool. Wool swirls dramatically, which is really important for a Grey Warden." Instead of making Harry go the way the story needs to go, Butcher finds that "I just give Harry the motivation to go in the right direction so that he doesn't go off track. If he does, I have to go back and make sure he has the information to make the right decision." When asked about fighting in his books, Butcher merely answered, "My Dad's a Ranger. And I listen to guys who have been there." When asked about future projects in the Dresdenverse, Butcher said, "Children and dogs steal everything, if you make them interesting. I am one novel away from releasing my next book of anthologies. It should take a month for me to finish. It'll be Harry's first day as a dad from Mouse's point of view. Why? Because Mouse is the most emotionally balanced person in Harry's world." Other than that? Harry's daughter Maggie might end up with her own series of YA novels, a sort of Dresden Hogwarts. The premise is simple, "What if there really are monsters under the bed that we forget about when we grow up? And they're all at this school, and the kids have to fight them?" It will be loosely based off of the experience of Butcher's sister ... mostly her six kids who all go to Catholic school. Basically, this place would be a boarding school, where Maggie would spend summer with her dad, and be "away at school, where they think it's safer." As Maggie suffers from a lot of social anxieties, "Mouse would act as her service dog. Though Maggie is perfectly fine when everything's on fire and people are screaming. It's her superpower." Heh. No need for a paternity test, Harry is definitely the father. When asked about a frozen turkey falling out of the sky, destroying a car, and going "Ding!" Butcher states that he stole it from Looney Tunes, and he had been operating on no sleep when that happened. Oh yes, apparently, Lucifer himself is going to make an appearance at the end of the series, the "apocalyptic trilogy" at the end. When someone asked "Did you know there's a Pharisee named Nicodemus?" Butcher said, "No? Really? Come one, I've memorized whole books of the bible. But did I put a biblical character in there? I will not confirm or deny." While Butcher has the major character arcs and story mapped out, he does not have minor side characters planned out in advance. Butters was supposed to be a throwaway character, because Jim needed some levity during a grim autopsy scene. When it came to Dead Beat, Dresdent needed the sidekick du jour, and that person had to be "tactically useless." Butters for the win. Afterwards, Butcher realized, "Wow, this little guy is a hero. I either gotta kill him or let him grow up." At which point, Butcher started planning where Butters would go. As mentioned the other day, Peace Talks is behind because he's between houses for the first time in his life, and he has no space to work, and he has no dog. His last dog died, and "he was the brains of the operation." He currently has cats. And "Cats are Tony Stark. All of them." His significant other, Kitty, and he agreed to get one cat, and they now have three. One of which is a little Tuxedo Cat named Zatanna. Next question: would we ever see the kid from the first short story ever again? "She will absolutely not walk in as the femme fatale at the start of the final trilogy. That will not happen. Really." On James Marsters doing the audio books, "They asked me 'Hey, you want Spike from Buffy for your books?' I did a happy dance all around the house, came back to them and said, 'Its okay.' And he must like doing them too, he's one of the highest paid actors on television. It's not like he needs the money." Q: "If Harry came to DragonCon, which hotel would he blow up." JB: "Which wouldn't? But I can't tell you that because it's a spoiler for the final trilogy." Q: "Now that Harry is in the Winter Court, along with Kris Kringle, is there any possibility that we'll have Harry Saves Christmas?" JB: "You mean like a short story? I don't like doing short stories. Every time I write one, I say it's going to be the last short story I ever do ... and if I did Harry Saves Christmas, it would be the last short story I ever do." On creating cat culture: "They're like little libertarians. They're even pissed off when they find that human's feed their kits. What are the humans teaching them by doing that! No. Shouldn't happen." And, since he has cats in his books, his cats are a write off. He is serious about that, "or the IRS gets all question-y." Yes, in case you were wondering, Jim has been influenced by Horatio Hornblower, Captain Aubrey, and Honor Harrington -- that's why it has wooden ships, sky pirates and a civilization of talking cats. One of his few complaints about the cover art is, after all the times that the artist puts a hat on Dresden's head, even though he's never worn one, the Captain of Cinder Spires wears a hat in the book, and there wasn't one on the cover! "At least have him holding a hat!" "Unlike my other series, I made this one on purpose. I had made Dresden to spite my creative writing teacher. I followed all of her advice to show her it wouldn't work. I showed her! And Alera was made on a bet, that I couldn't take two overused ideas and make them work -- in this case, Lost Roman Legion and Pokemon. With Cinder Spires, It came from a moment of inspiration, which is odd for me. I was driving home from an RPG, and I saw a cloud like a ship in the middle of a lightning storm. Wouldn't it be awesome to have two air ships duking it out in the middle of a storm like this? And I had to do the worldbuilding first. Though sometimes I had to build the world under my character's feet. I was basically making the X-men of Steampunk." Woah. Lookit those upper arms. Butcher-sensei works out. Seriously, Butters is one of my favorite characters in the series. He'd probably be able to freaking pick up Mjolnir and use it. Polka will never die! I am GREEN, I tell you, GREEN WITH ENVY that you got to be there. And am waiting for more stories about the con. I think I have news stories going into next week. I think the video posts start going up tomorrow. Did you see the video for the Dragon Award? Yeah, Jim pumps serious iron. He's a solid guy. Well... damn now I HAVE to read these books. Um. Anyone got a guide on getting started? There is an entire guide on The Catholic Geeks. Type in Dresden, go to the earliest, and brace for impact. Also, brace for the first few books. I didn't really get into them until book three, and that was because I had a three in one volume. Trust me, you'll want to stick with it. If you want a short series, Codex Alera. If you want to get in on the ground floor, The Cinder Spires. Dresden hits its stride in book 3, though I'm so far behind that I really shouldn't be talking. Still, book 3 is really good stuff. Dresden is "urban fiction" with a decidedly dark twist. And as stated, hold on and keep reading, he gets better and better. Codex Alera is more "epic fantasy" (though not truly epic fantasy, but it has leanings). I had to force myself to pick up book two, but then was hooked. Was he being serious about that being in the final trilogy or was he being snarky? I couldn't tell. No idea. Who can tell? Uh... is the guide in there? Doesn't seem like it.